eureka software has developed ES Compliance Tracker®, an off-the-shelf compliance management system for managers and operators of hydroelectric and energy facilities. eureka software brings a unique blend of technical expertise to those looking to develop a strategic yet efficient approach to managing their compliance needs. A robust compliance management process is part of a proactive enterprise-wide strategy to identify potential issues well before they become compliance violations. The development of preventive strategies early in a process leads to a smooth compliance period, easier auditing, and more accurate reporting. A tool that accurately documents the record of compliance activities is essential for managers to meet today’s regulatory requirements. Good compliance management is good business management, and paves a smoother road for the entire compliance process with a complete audit trail. ES Compliance Tracker is a proactive tool that helps manage and record the complex compliance process. A variety of features are available to structure and organize compliance data, generate appropriate reports, create reminder letters, and keep the process on track and moving forward. Data entry should be easy and intuitive. 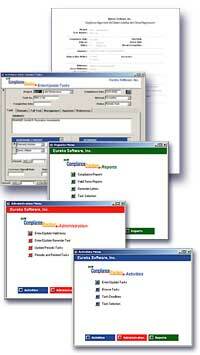 ES Compliance Tracker's user interface has clear and easy-to-use data entry fields that populate a variety of customized reports. There are several ways to locate either a single task or a group of tasks. Task review summaries provide a real-time look at which tasks are due and who the responsible parties are. Track accountability and deliverables with easily generated individual reports or summary reports. Any report can be conveniently emailed to responsible parties directly out of the application. Custom reports can be configured to specific compliance needs. Reminder letters are easily generated and can be printed and mailed or emailed directly to responsible parties. Reminder letter text can be customized and letters can be generated with one click at any needed daily interval! Links to supporting documents for each task can be added for full accessibility. Additionally, eureka software can create a collaborative website to house the documents. On-site training is available from eureka software. Copyright © 2014 eureka software, inc. All rights reserved.